On the back of the link to www.rungeordierun.com appearing on nufc.com a couple of days ago, there have been some brilliant messages received from exiled Geordies who live on or near my route through Ukraine and Russia. Given how valuable such assistance has proved to be in the past (notably in California, Nevada, The Rocky Mountains, New York, Perth and Sydney) I'll be following up on these offers of help. 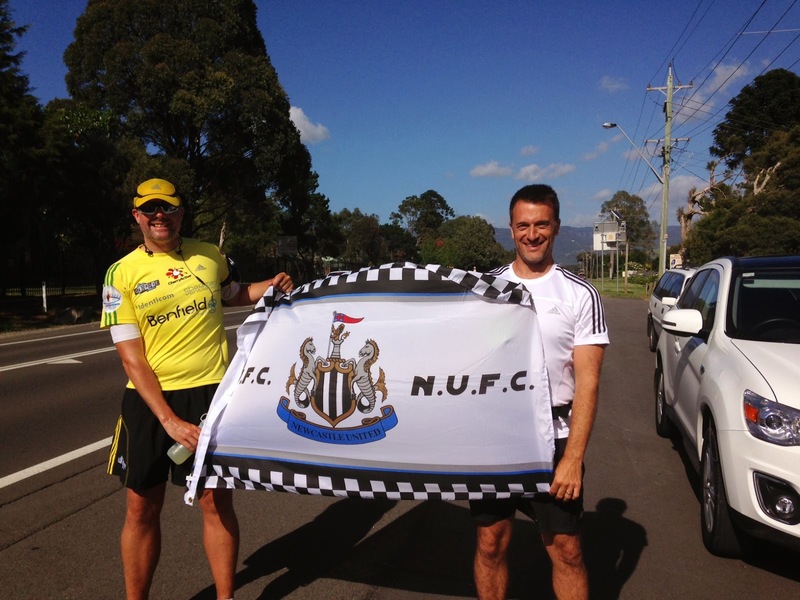 I've met some amazingly friendly and helpful Geordie ex-pats during the first 9,000 miles of the run around the world. Some of them have proven to be absolute game changers and all of them have shown me some incredible kindness and support. Nick Davison and his family (pictured above) let me hang out at their house during the build up to the run across the USA. I remember eating the most delicious sandwiches! Nick ran the first few miles with me on day 1 from Huntington Beach. Nick also tipped off his friend that I would be running through where he lived in Denver (See below). 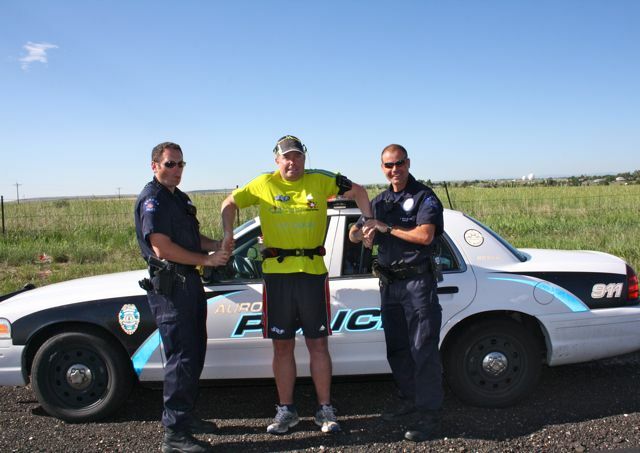 I was only 2 miles into day 41 of the run across the USA when I noticed a car pulled up ahead. Then I noticed the driver with a black and white shirt on. It was Dave and Lesley Greaves (pictured above) who had been driving all day to try and find me. They were on holiday and wanted to hand over 200 US Dollars (£123) sponsorship money from the NUFC Midlands Supporters Club. What a gesture! What generosity! What great timing when I felt quite lonely on the road. 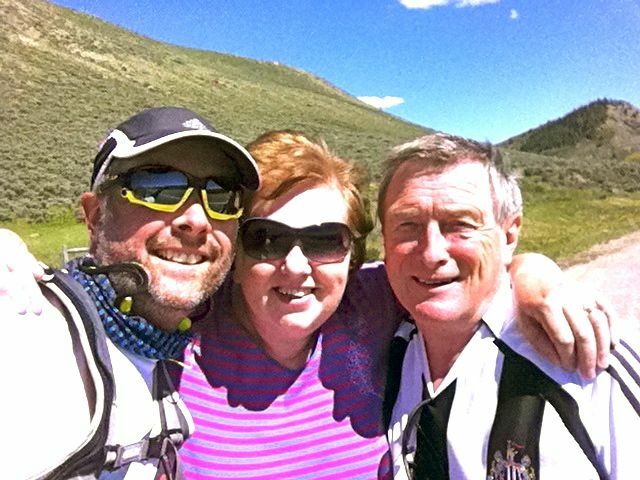 Nick Davison's friend, John Bulman (pictured with his partner Carrie above) was a police officer that I met in the Rocky Mountains west of Denver. He ran with me for a day and helped make the miles go quicker. If memory serves me correct he was from Keswick originally and was a Carlisle United supporter. I also remember Carrie introducing me to an energy product called Honey Stinger Waffles. A few days after meeting John, he brought his colleague to meet me (pictured above) as I ran east out of Denver. That's one of my favourite photos of the entire run around the world so far by the way. Who can ever forget the people pictured above who ran with me for the final 13 miles of the run across the USA. I'd suffered a week of terrible anxiety finding it hard to deal with being so close to the finish line in terms of time but not in distance. I'll be forever grateful to the Toon Army NYC branch for the company on those final miles on what turned out to be a 60 mile day. Also present at the bottom right hand corner is Dave from Real Radio. He ran a few miles with me as I reached NYC but had to get a taxi to the finish line as his feet were sore! Pictured below is Alan and Tim (aka The Exiles) who wrote and recorded a charity song (available on iTunes - search Run Geordie Run). Alan (and his wife) were at the start and end of the run across the USA. 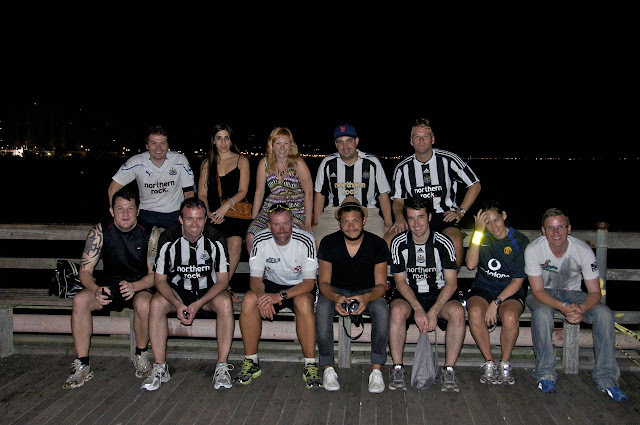 Tim made it to the finish in time for a celebratory pint with the rest of the Toon Army NYC branch. Pictured above are Mel and John from Perth, Australia. John, originally from Cramlington, reached out to me after seeing coverage on nufc.com. 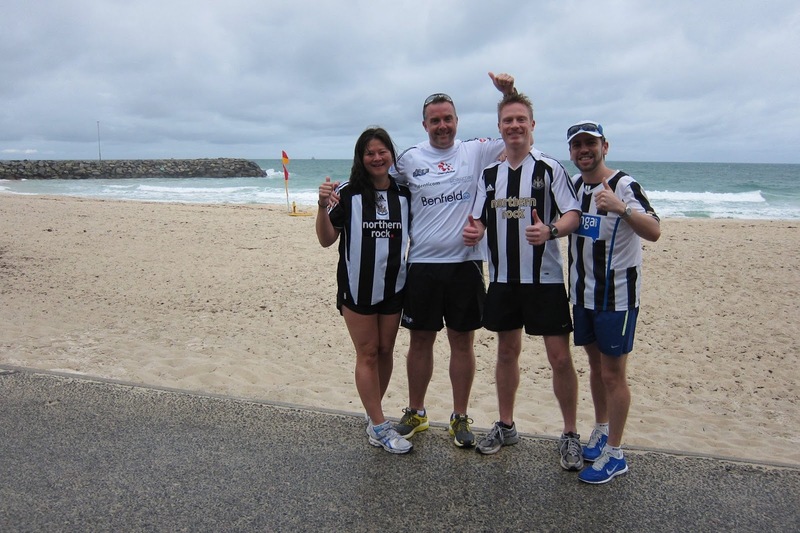 Along with Darren (pictured below on the right) they were at the start line of the run across Australia at Cottesloe Beach. Darren and John ran the first 13 miles with me and it proved to be a great send off on what was to become the most difficult stage of all those done around the world so far. Mel and John let me use the facilities of their holiday cottage on day 2 and were present on support team duties from days 8 - 13 of the run across Australia. They both cooked many a fine meal and various snacks throughout their time on the team. They even converted Graham on the support team to meat after decades of being a vegetarian such was the quality of their cooking. 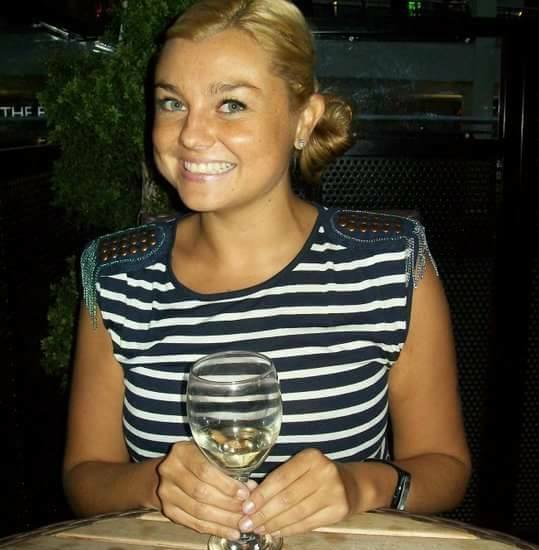 Pictured below is Helen whose relation initially saw a request for help for accommodation in Perth on Twitter. Helen was kind enough to put me up for a few days before the run across Australia started, helped me shop for supplies and (due to the nature of her job) provided telephone support when I needed it. That phycological support was extended 3 years later during the run across Europe. Helen has had a patient knack of helping me to gain a sense of perspective and putting me back on the right course on some very difficult and dark days. Pictured above is the person who I refer affectionately to as "The man who saved day 63". I'll let Donna's blog post from the day take up the story. A spectacular start to the morning was soon to be over. Mark was becoming increasingly hassled by the flies and the pain had started again in his feet. Mark sent me a message so say how much he was struggling, I knew that this would be a low end to the morning. As I waited for Mark to approach the RV, I started to prepare for water exchange and a snack. Just then I heard the blip of a siren. My heart sunk, I was parked perched on the corner of a farmer's track – was I in trouble? 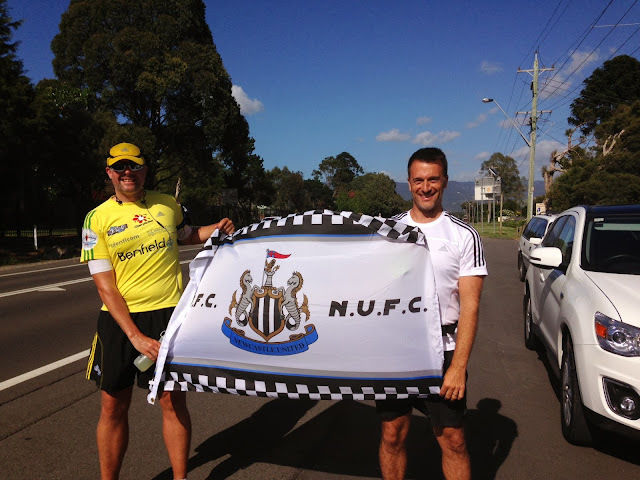 I coyly went to the front of the RV to step out and saw a flash of a Newcastle top! This had to be good news! 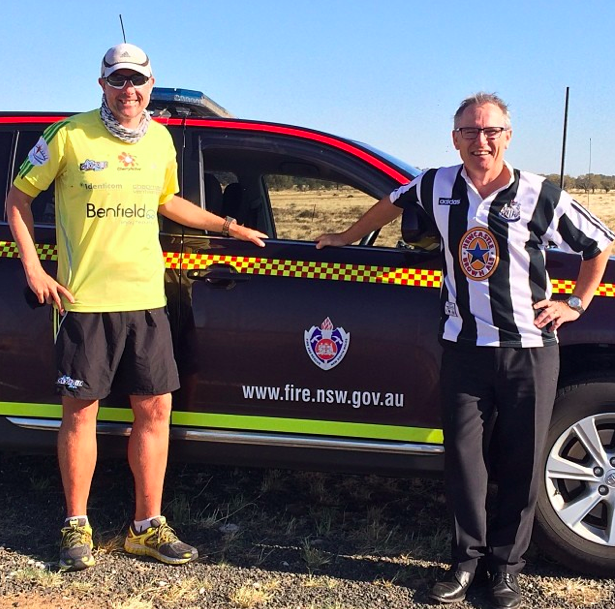 I was greeted by a big smile from Andrew, the Zone Commander for New South Wales Fire and Rescue. Andrew had previously been in touch on Facebook as he lives in a town not too far from where Mark would be running. 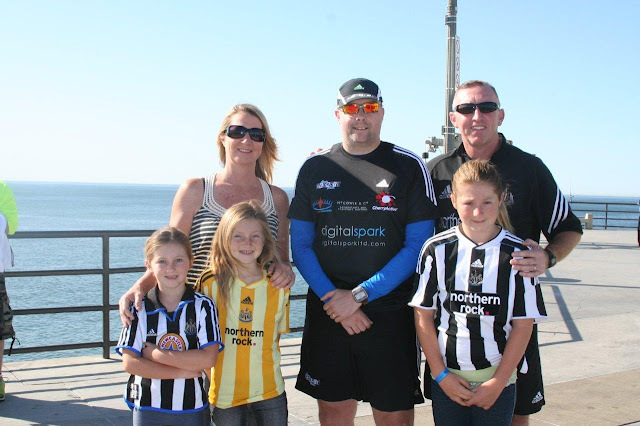 Andrew's Dad was originally from North Shields so the family are big supporters of 'the toon'. This was great! In the distance a very dreary Mark was heading towards us, he almost dropped to his knees when he saw the friendly black and white stripes. His pace quickened and he greeted Andrew with a huge bear hug!". The rest, as they say, is history and Andrew spent the next few days bringing supplies and checking in on us. His job covered a huge area and he passed us quite a few times. I genuinely think that I was ready to quit that day. I dread to think what the outcome would have been without our chance meeting with Andrew. "The break with Andrew had cost Mark an hour, it was certainly well worth it as he skipped into the next running stretch for the day.". I tweeted "Break over. Time to get back out there. I'm in the mood to attack again.". 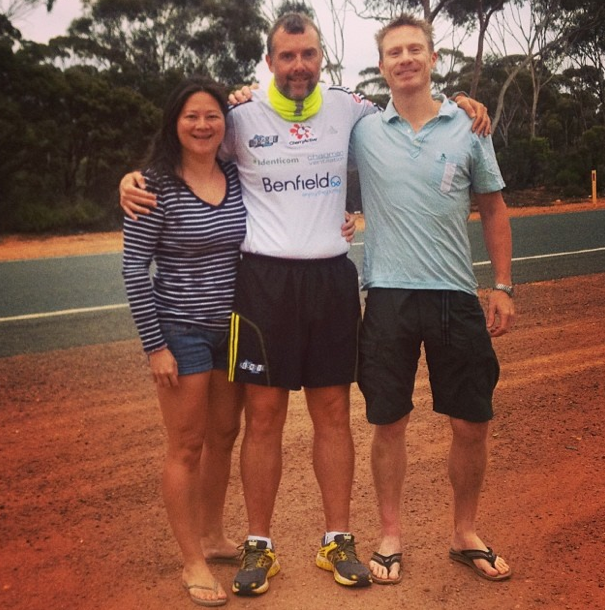 Finally, there was Pete Smith (pictured above) who ran the final 10k of the run across Australia with me. The previous 2378 miles from Perth had been physically and mentally torturous. The final 6 miles with Pete were very calm, casual and I remember feeling like I was on a lunchtime training run. It was such a contrast to the previous 81 days of heat, flies, blood, sweat, tears and pain. Donna's blog from the day - "I presumed that it was someone who had stopped to check that Mark was ok - a common feature of the last 82 days. How wrong could I be? Just when the glory of the finish line awaited, up pops a Geordie! 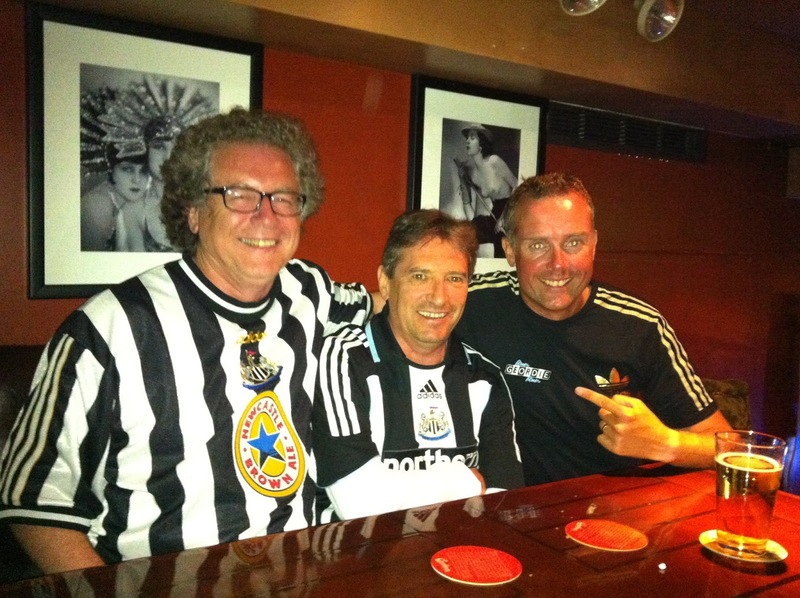 Pete Smith, a friend of nufc.com, lives in Sydney and had followed the journey throughout. As luck had it he was in the area with family and kindly offered to join Mark as support for the final stretch.". As well as the people mentioned above there are the various support team members, the local well wishers, the sponsors and helpers and all of the kind people who support me via social media. 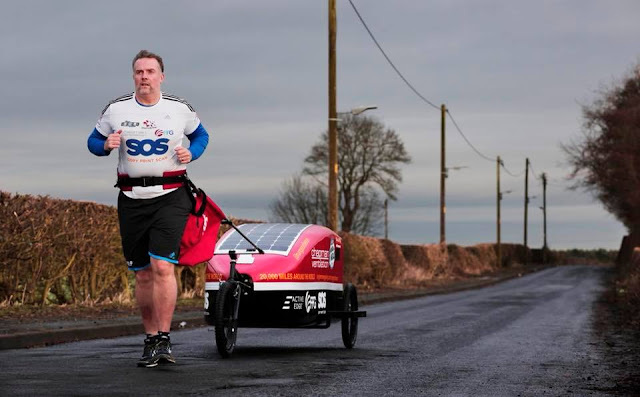 Putting all of that together has meant that I have managed to successfully run 9,000 miles across the UK, USA, Australia and Europe. There are so many people to write about and thank when I sit down and think about it. All of the liaisons with the above people can be traced back to coverage given to my running on nufc.com. There's another set of people to thank for sure! Of course, I now have Chappie (The Chapman Ventilation Around The World Buggy) pictured above, to support me. I'm looking forward to writing about the next group of people that we'll meet between Belgrade and the southern tip of New Zealand in a few years time. Every ounce of help offered to me during the remaining 11,000 miles across Serbia, Romania, Ukraine, Russia, Kazakhstan, China, Japan and New Zealand will be gratefully received. The support and generosity shown is never something that I take for granted. It has and will continue to help me achieve my ambition to go some way to repaying the debt of gratitude that I feel towards local charities. Raising half a million pounds or more by the time I reach the end of the world is not going to be an easy task. Running the remaining 11,000 miles isn't going to be easy either and isn't without its fair share of risks. What in life that is worth anything at all comes easy? 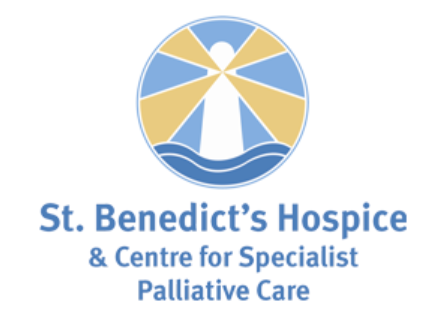 This promises to be a continuing fascinating journey and with a lot of help and support I'm confident of suceeding.